4 Bedroom Detached House For Sale in Crawley for Guide Price £600,000. 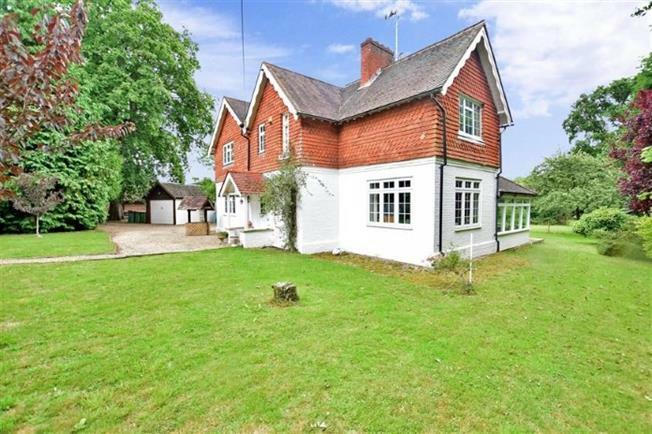 Offered to the market chain free is this beautifully presented four bedroom detached house, located on the outskirts of Crawley in a beautiful rural location but still within easy reach of Crawley's amenities and good access to Gatwick airport. This property is boasting with potential, with a workshop and detached garage and extensive off road parking and driveway space. Inside is the beautiful farm house kitchen and dining room with utility area over looking the surrounding garden space, the lounge with fire place, sun room that opens to the rear garden over looking fields, down stairs bedroom and downstairs WC. Upstairs are the three bedrooms, study room, shower room, bathroom with his and her wash basins. Call today to book your appointment to view. Double glazed uPVC window facing the side overlooking the garden. Tiled and vinyl flooring, ceiling light. Fitted, wall and base and breakfast bar units, integrated oven, space for integrated hob dishwasher, space for. Patio . Tiled flooring, ceiling light. Single radiator and open fire, laminate flooring, ceiling light. Triple aspect double glazed uPVC windows facing the rear overlooking the garden. Radiator, carpeted flooring, ceiling light. Laminate flooring, shelving, ceiling light. Vinyl flooring, ceiling light. Single enclosure shower, wash hand basin. Heated towel rail, vinyl flooring, ceiling light. Standard WC, corner bath, twin sinks. Radiator, laminate flooring, a built-in wardrobe, ceiling light.